If you’re looking for an easy, interactive way to earn money online, consider teaching English with VIPKID. You can work from anywhere with an internet connection, set your own schedule, and help young students improve their English skills. VIPKID has earned a strong reputation for its innovative platform and great employment opportunities. Read on to learn whether it’s the right fit for you and how to start! Become a VIPKID Teacher Today! VIPKID has taken the world of remote jobs by storm, with over 30,000 teachers and 500,000 registered students. Although it was only founded in 2013, the company has seen exponential growth and rave reviews from the educational community since then. Opportunities to teach English online with VIPKID are best for: stay at home parents, digital nomads, entrepreneurs, and teachers. Because you can set your own schedule and choose how many hours to work each week, it’s possible to be a full-time teacher with VIPKID or use the platform as a side gig. The students through VIPKID are Chinese and between the ages of 4-12, and the teachers are typically American or Canadian. Lessons are 25 minutes each, with 5 minutes in between to make notes and take a quick break if needed. Teaching hours are centered around waking hours (typically 9am-10pm) in Beijing, with peak times being in the mornings and evenings. Teachers earn $14-22 per hour with the opportunity for additional bonuses, so it’s even possible to earn a full income and save on top of that if you’re based in a country with a lower cost of living. If you are in North America, have a degree and some teaching experience, you are wanted as a VIPKID teacher. VIPKID provides its teachers with verified lesson plans based on the U.S. Common Core State Standards and uses a “flipped classroom” style of teaching to enhance student learning. In other words, the learner studies the curriculum independently at home and then goes over homework and hands-on activities online with the teacher. This way, the student takes more ownership over the learning process — and is able to use the teacher as an interactive resource. Flipped classrooms have been hailed as an excellent alternative learning style and the answer to some problems that exist in education today. Instead of relying on teachers to provide all of the information involved in a lesson, students study it themselves through videos and materials at home. They can work at their own pace and supplement the lesson with additional research if necessary. Then, they already have a basic understanding of the lesson by the time they meet with the teacher. VIPKID uses the flipped classroom method, so teachers work more collaboratively with students rather than simply lecturing them about a lesson. Students get 1-on-1 attention online, and they can regularly book their favorite teachers for lessons. have at least one year of experience teaching, tutoring, or working with kids. Teachers also need the proper devices to work online. Specifically, a computer with a camera, a headset with a microphone, and of course a reliable internet connection no matter where you are teaching from. In addition to the requirements above, VIPKID recommends a number of soft skills in order to succeed as an online teacher. Candidates must be energetic, engaging, and able to connect with children. Although VIPKID provides all of the teaching curriculum and lesson plans, most teachers provide their own visual props (like alphabets, flashcards, puppets, etc.) to enhance the lessons. VIPKID also requests that their teachers sign a six-month contract and be available for at least 7.5 hours per week. Of course, some teachers may work 30 hours one week and zero the next, but it’s best for everyone if the teachers maintain somewhat regular hours for their students. There are countless benefits to teaching English with VIPKID, which is why so many people have signed on as teachers since the company’s inception. One of the biggest perks is that teachers can work from anywhere as long as they have a reliable internet connection and the right tools to conduct classes. With the demand for remote work on the rise, VIPKID provides an excellent opportunity for people looking to work from anywhere or earn additional income from the comforts of their home. Because of the ability to create your own schedule, you can work with VIPKID as much or as little as you would like (providing you’re still teaching at least 7.5 hours per week). Some teachers use the platform as their primary source of income and work 40+ hours per week, while others teach a few classes on weekends to expand their teaching experience and earn money on the side. VIPKID is also a verified, reliable company to work for, and their pay is competitive. With the opportunity to earn up to $22 an hour, teachers can earn a reasonable living with VIPKID depending on where they’re based. If you’re considering using VIPKID as your primary source of income, keep in mind that you still need to pay taxes on your earnings — so your take-home pay will be less than the amount advertised. For the most part, VIPKID has great reviews and is rated by its teachers as an excellent employer. It has a 4/5 star rating on Glassdoor, and 79% of employees would recommend it to a friend. Teachers cite the bonuses, advancement opportunities, community events, and flexibility as reasons that they enjoy working for VIPKID. Additionally, the company provides the curriculum needed to conduct classes, so teachers are not responsible for slaving over lessons beforehand. Overall, working with VIPKID is a fantastic opportunity for people who want to work remotely and help young Chinese students learn English. Although teachers can create their own schedules, they must work around the peak hours in Beijing in order to maximize their time and earnings. Peak hours center around weekday evenings and all day on weekends in Beijing. For context, 6-10pm Monday-Friday in Beijing translates to 5-9am EST and 2-6am PST. On weekends, 9am-10pm in Beijing translates to 8pm Friday-9am Saturday EST and 5pm Friday-6am Saturday PST. Wherever you’re based in the world, you can compare your time zone to that of Beijing to figure out what hours would be best for you to work. Teachers should expect very little work outside of the peak hours because students are typically in school during that time. 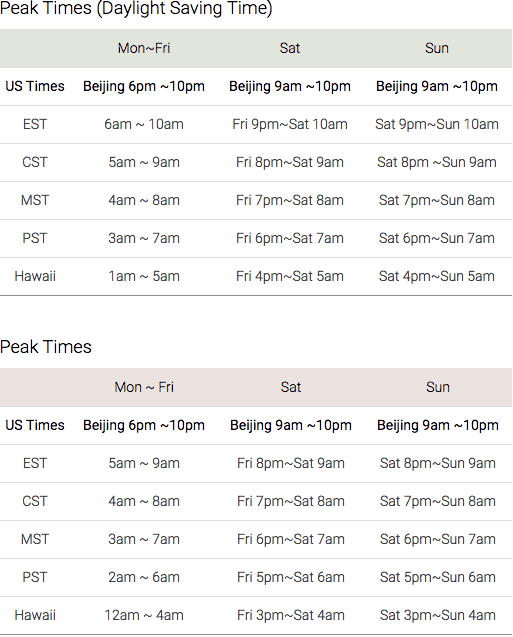 Table: “Beijing peak hours” and translation into US times. VIPKID Teachers are advised to offer lessons within these hours. As a teacher with VIPKID, your base salary will be $7-9 per lesson depending on your experience and your performance in the demo lesson of your application (more on that later). If you show up to your lesson on time and teach it in its entirety, you will get an additional $1 per class. If you teach more than 45 classes per month (which equates to about two classes per day), you also receive an additional $1 per class. That’s easy bonus money! In short, the minimum you can make per hour (for two 25-minute classes) is $14, and the maximum is $22. On top of the two possible bonuses mentioned above, there are a few ways you can earn additional money with VIPKID. The first is through conducting a trial class that converts into a student signing up for the platform. Any time you open up a time slot, you can be booked for a trial class. If that trial class is so good that the student wants to sign up with VIPKID, then you’ll receive an additional $5 on top of the base pay and bonuses you earned. The second is by referring someone to teach through VIPKID. Every teacher has their own referral code, which you can share with others who are interested in becoming teachers as well. If they sign up with your referral code and successfully teach one class, then you’ll receive a referral bonus of $50-$80! Payment from VIPKID comes via direct deposit to your bank account once per month — usually in the middle of the month. When you calculate your monthly income with VIPKID, keep in mind, that you have to pay income taxes in your home country by yourself. VIPKID’s cancellation policy is a bit tricky, and it’s important to stay on top of any updates the company releases. For each six-month contract, teachers are allowed six cancellations. Three canceled classes count as one cancellation, and you will be penalized with a maximum of two cancellations per day. For example, if you are booked for three classes one day and you have to cancel all of them due to illness, you will use one of your six allotted cancellations. VIPKID will charge you $10 if you cancel less than two hours before a class or don’t show up at all; $2 if you cancel 2-24 hours in advance; and nothing if you give over 24-hours notice. Six cancellations would translate to six days of three canceled classes, three days of six canceled classes, or some combination of the two. VIPKID reserves the right to terminate your contract if you use more than the allotted cancellations. One of the biggest challenges that new VIPKID teachers mention is the lack of classes initially. Keep in mind that you may not fill up your teaching schedule until you’ve been working with VIPKID for three months or more, so plan to have an alternative income source in the meantime. Earning money with VIPKID is more of a “slow build,” rather than instant gratification. The longer you work with VIPKID and the more quality lessons you deliver, the faster your schedule will fill up. As such, it’s very important to perform great lessons and go the extra mile for your students at the beginning — otherwise, they may not come back. Another challenge, especially for people using VIPKID as their main source of income, is saving the appropriate amount of money for taxes and treating their work as a small business. This means saving 30-40% of your earnings each month for taxes, and ensuring that all of your finances are in order throughout the year. Although the teaching itself can be very fun, it’s not without flaws. Every teacher deals with cancellations and no shows on a regular basis, and sometimes the classes simply aren’t enjoyable to teach. Perhaps your student doesn’t want to be there, isn’t interested in the lesson, or is having disciplinary issues. Perhaps the hours aren’t suitable for you, and you either have to wake up very early or stay up late to teach. Perhaps you’re tired and struggling to maintain the energy needed to engage your students. These challenges are all important to keep in mind as you decide whether teaching English with VIPKID is right for you. If you’ve decided that you do want to submit an application to teach for VIPKID, there are a number of steps to follow. Ensure that you meet all of their requirements — VIPKID is serious about them, so don’t bother applying otherwise. Submit your resume and the online application. If you are selected to continue in the hiring process, VIPKID will contact you to complete a pre-recorded or live interview (the latter would be scheduled on Beijing time). Complete a pre-recorded or live demo class, so that VIPKID can ensure you have an effective teaching style. The interview and demo class are the most important parts of the hiring process, and it’s essential that you perform well if you want to get hired. If you don’t have a teaching certification, ensure that you can talk about your teaching experience and convey that you’re an effective teacher. For the demo class, VIPKID will send you a sample lesson to prepare beforehand. Make sure you know the lesson inside and out, use plenty of Total Physical Response (“TPR”), and bring props for extra points. TPR involves using physical movements to supplement language teaching, and it’s an important component of VIPKID’s platform. If you aren’t familiar with it, you should study and practice it before completing your demo. Remember to also dress professionally, speak clearly, and convey your enthusiasm throughout the lesson. If VIPKID chooses to move you forward in the hiring process, you will be asked to study a training manual and videos, and then pass a test on the required material within 10 days. You can take the test multiple times, so start studying early to ensure you have enough time if you don’t pass it immediately. After passing the test, you will complete two mock classes with a VIPKID employee. The employee will act as a student and expect you to complete the lesson effectively. He or she will offer feedback on your first lesson, which you should absolutely implement in the second. Just like with the demo class, prepare to perform as well as possible — these mock classes are the last stage of the hiring process, and they may determine the starting salary you receive. Be fun and energetic during VIPKID lessons, to use Total Physical Response (TPR) Activities and props to engage your little student. Once you’re accepted as a VIPKID teacher, you’ll have access to the Teacher’s Portal on VIPKID’s platform. This is where you can view upcoming classes, update your schedule, and conduct lessons. The teaching platform is one developed specifically by VIPKID, as are all of the lesson plans. Teachers don’t have to spend hours planning and perfecting lessons, which is one of the big perks of teaching with VIPKID. Students can book classes up to 24 hours in advance, so it’s important to check your schedule regularly. You’ll want to create a space to conduct classes that is quiet, comfortable, and full of the props that you’ll use throughout lessons. For each class, ensure you have everything ready to go at least 10 minutes before your first lesson of the day. If you book classes back-to-back, there will be five minutes between them to get a drink or use the restroom. Most teachers use this time to jot down notes about the lesson — i.e. the student’s performance, what to focus on next time, feedback for the parents, etc. Students will be able to see your face and upper torso throughout the lesson, so it’s important to present yourself appropriately. Two of the most important aspects of the preferred teaching style are: energy and TPR! Since students are between 4-12 years old, it’s crucial to bring a high level of energy to your lessons and to use TPR. Otherwise, the students are unlikely to understand or stay engaged. Most teachers also highly recommend using props and a reward system for the students. Visual props like flash cards, alphabets, and colors really enhance an otherwise verbal lesson. Reward systems, like giving the students a sticker or high-five, boost student morale and encourage them to work harder. Feel free to get creative with your reward system — one teacher printed out a smiley face and attached a Velcro tooth every time her students performed well. At the end of the day, if you’re having fun — it will come across in the lesson, and your student will have more fun too. As mentioned earlier, it can take months to fully book your teaching schedule with VIPKID. With over 30,000 current teachers, there’s a lot of competition! It also takes time to build your reputation as a good teacher who students want to book over and over again. However, there are some steps you can take to increase your competitiveness in the market. The Seccess Secrets to Becoming a Successful Online English Teacher with VIPKID. First, make sure your teacher profile is both professional and fun. On your profile, you can upload pictures, an introductory video, and a bio. These are prime opportunities to let your personality and professionalism shine! First impressions are important, so make yours count. Second, open up your schedule in advance and during the peak hours. If you only open up the time slots that are convenient for you (i.e. during the afternoon or normal working hours), you may miss out on tons of classes. Pay attention to Beijing’s hours and adjust your schedule accordingly. You should also open up your schedule as far in advance as possible. This allows parents to book you for recurring lessons at least two weeks in advance, which makes scheduling easier for them. Third, make sure you’re delivering quality lessons! If not, students won’t re-book you and parents won’t give you good ratings — which will hamper your ability to attract future students. Finally, pay attention to the holidays in Beijing when setting your schedule. Students may be traveling or taking time off during the summer and Chinese New Year, so booking may be slower than normal depending on the time of year. Working with VIPKID is an excellent opportunity for people who want to work remotely, teach English to young students, and join a company that is growing in both size and reputation. It’s also a smart option for those who want to pursue teaching English as a career without necessarily moving abroad. The job is best for people who are energetic, enjoy working with kids, and meet all of VIPKID’s application requirements. As with any job, teaching English online has its flaws — although the majority of VIPKID teachers believe the pros far outweigh the cons. If you’ve read the full guide on teaching English with VIPKID and believe you would be a great fit for the job, consider applying to join the thousands of teachers already out there today. Brooke Matta is a girl in her mid-twenties who loves her home in the U.S. but still leaves as often as possible to explore the world beyond. She's lived in Costa Rica and Spain, and has been teaching with her TEFL certification. Read her Upbeatatlas Blog or follow her on Instagram.